If you've never worked in a large, busy hospital, you probably have no idea of the importance of the telephone and paging system. It calls doctors, lab workers and respiratory technicians to areas where they are needed. It dispatches everything from medicines to custodial services. And when a patient goes into cardiac arrest, it must summon the Code Blue team within seconds. When such a system fails, the Hospital Administrator knows that he or she is in the midst of a disaster. Imagine trying to handle all of the communications in a six-floor hospital with runners, even if enough runners were available. A cadre of trained Amateur Radio operators could do the job much better. And that's just what happened at St. Jude Hospital and Rehabilitation Center in Fullerton, California on 22 October. At about 6 PM, all of the internal phones and the paging system in the 308-bed facility went silent. Only a few pay-phone booths, on separate outside lines, were functional. From a pay phone, the switchboard (PBX) supervisor hurriedly made three calls. The first was to the phone system provider. Then, even before calling the Hospital Administrator, she called the first name on her call-up list of Amateur Radio operators: April Moell, WA6OPS, Emergency Coordinator for the Hospital Disaster Support Communications System (HDSCS). "Prepare a room in ICU for an ER patient. He is a 48-year-old male. Diagnosis is 'rule-out-MI.' Advise room number." "Locate a Respiratory Technician and send to ER, stat!" "Deliver Pyridium, 100 milligrams p.o., from pharmacy to the 4-West wing. Patient is Sally Smith in Room 453." "Locate a janitor and send to the Labor/Delivery area." Vital traffic was almost non-stop. The hospital provided two runners to work directly with the hams. They were used to make calls to doctors from the pay phones and carry messages to areas not covered by ham operators. The ability of the net control station at PBX to directly dispatch them kept the number of runners needed to only two. Communications within the hospital was done on two-meter simplex. Meanwhile, from his home in Yorba Linda eight miles away, Assistant Emergency Coordinator Ted Kramer NB6N kept in touch with the group on the ARES repeater. It was Ted who kept making phone calls to line up relief operators for a possible second shift. Had the pay phones failed or been inadequate, he and others would have provided the telephone links to the outside world. Several modules in the hospital's phone switchgear had failed, so the serviceman had to make several trips to his warehouse. As the evening wore on, uncertainty about the length of the failure increased. A second shift of operators was called out to arrive about 11 PM. They were just getting into place when the phones came back up. After 30 minutes of waiting to be sure that the system was indeed fully restored, the net disbanded, to hear heaping praise from all of the hospital people involved. Some of the hospital employees wanted to know more about these Amateur Radio operators. How did they know just what to do in a hospital? They acted professionally and didn't get in the way. That wasn't by accident. This is an experienced group. 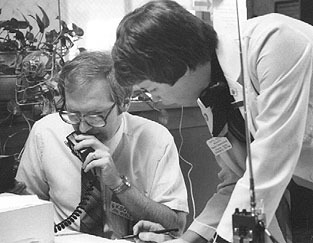 It was a phone outage at this same hospital in October 1979 that led to the formation of the HDSCS. Hospital employee WA6OPS found herself at that time calling for whatever help she could get from listeners on the repeater. Some of the responders had to come a considerable distance. What if she hadn't been at work when the phones failed? The experience convinced her that there was a need for an organized group to help her hospital in "little disasters" such as a phone outage as well as major occurrences such as mass casualty incidents and natural disasters. The positive response by the hospital administration and its representative on Orange County's Emergency Medical Services Disaster Committee led to inquiries from other facilities. Could they get some hams, too? A year later, seven hospitals were being supported. Phone outages, both planned and unplanned, have been the most common callouts. The most recent before this one was at Kaiser Anaheim Hospital, an eight-floor facility where five hams provided communications during two failures on successive days. Working in a hospital isn't like doing communications for a bike-a-thon or even a hurricane. Just as in these other cases, hams in hospitals must be quick, brief, and highly accurate. But they must also know something about the special terminology they may encounter in a medical message. In patient areas, a ham must be prepared to see and cope with emergency medical care "in the raw," particularly in a mass casualty incident. So the first half dozen people to come "out of the woodwork" on the local repeater aren't necessarily the best ones to send. Advance training is very important. Every ham responding to St. Jude Hospital on October 22 was trained and experienced in the hospital environment. Drills by participating hospitals with the county police/fire/paramedic providers include Amateur Radio. Walk-throughs are held at the participating hospitals to check out radio paths and allow members to meet the hospital supervisors who are responsible for emergency preparedness. Membership meetings are held five times a year, with speakers on emergency related topics ranging from disaster triage to the Incident Command System. The acceptance by the original hospitals in the system has been so great that there are now agreements with 23 hospitals in Orange County. The HDSCS provides two lists to each hospital. The Call-Up list gives day and night phone numbers of hams who live and/or work within just a few minutes of the hospital. They can activate the system and also personally respond with equipment within just a few minutes in the case of a phone outage or mass casualty incident. The second list assigns a Core Team to each hospital. Hams in the core teams have agreed that in an area-wide disaster they will go to the hospital with equipment as soon as their own families are secure. They don't wait to be called because in such a situation (an earthquake is an example) they know they'll be needed and that the outside phones may be down. To be in a Core Team, the ham should not have other emergency-related commitments to his work, his church, or another agency. Two-ham families are often ideally suited for Core Teams. Orange County Hospitals are so grateful to have the Amateur Radio volunteer assistance that they're eager to reciprocate. They sometimes offer payment to their emergency responders, which of course must be declined. HDSCS asks instead that the money be spent to install Amateur Radio antennas on the facility, with ownership retained by the hospital. Most of the hospitals have installed or are installing outside VHF antennas and coax runs. But HDSCS never demands that hospitals provide antennas. Our operators are trained to bring their own complete stations in any emergency, with the assumption that the hospital's antenna may be inaccessible or inoperative. Other ways that hospitals reciprocate include providing rooms and speakers for membership meetings. They also have financed ID cards for HDSCS members. The hospitals have also been advocates for Amateur Radio at meetings with other agencies in the county. Through the support of the hospitals, Amateur Radio is achieving greater recognition among emergency service providers. This results in greater cooperation during both drills and actual emergencies. While it might appear the work of supporting hospitals could bring excellent publicity for our hobby, care must be exercised. Some hospitals may not like having the world know that their phone systems are failure-prone, for example. Remember that the good will of the hospital/ham relationship is worth far more than a few column inches in the local paper. Before publicizing any in-hospital activity, consult the hospital's public relations department. The hospital PR people may even be willing to help spread the word about drills and disaster support. Like most areas of the country, Orange County has an elaborate commercial VHF/UHF radio repeater system for police, fire, paramedics, and local/county governments. The hospitals, on the other hand, have only one simplex VHF channel, called the Hospital Emergency Administrative Radio (HEAR), to communicate among themselves. They have come to realize that Amateur Radio is a valuable addition, for in an emergency hams can contact the scene of the disaster and other agencies such as the Red Cross. HDSCS has presented its capabilities to hospital emergency planners from all over the country by giving seminars at the Western Disaster Symposium. The response has almost always been, "This is terrific! How can I find some hams in my area?" Chances are your own local hospitals could benefit from the support of your ARES or RACES group, and they may be able to help your group with training. Ask them. In the photo: Joe Moell KØOV and April Moell WA6OPS were part of a team providing backup internal and external communications during a telephone outage at St. Jude Hospital and Rehabilitation Center in Fullerton. Update: This article appeared in the Public Service column of QST magazine for January 1986. QST is the monthly magazine of the American Radio Relay League, the largest national organization of Amateur Radio Operators. After that publication, HDSCS continued to grow and support the needs of Orange County medical facilities. It was activated in 124 emergency situations including two Metrolink train crashes, the Northridge and Whittier earthquakes, the Laguna firestorm, several floods, and dozens of telephone system failures. All acute receiving hospitals in Orange county entered into agreements for HDSCS support. Group paging was added to the call-up options for all hospitals. QST featured HDSCS again in the Public Service column of the December 1997 issue.